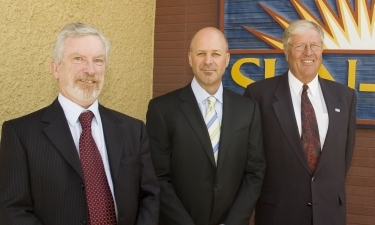 From left: UBC Okanagan Deputy Vice Chancellor Doug Owram joined Sun-Rype's CEO Eric Sorensen and Board Chair Merv Geen in announcing Sun-Rype's scholarship endowment. Sun-Rype Products Ltd. has donated $125,000 to UBC Okanagan to establish the Sun-Rype Founders' Scholarship Endowment Fund. "We are extremely pleased to establish this scholarship endowment at UBC Okanagan," says Eric Sorensen, Sun-Rype's President and CEO. "Sun-Rype has been a vital part of the Okanagan for 60 years. As we celebrate this milestone, we recognize the dedication and hard work of Sun-Rype's founders by investing in the future of our community. These scholarships will support the post-secondary ambitions of top students from throughout the Okanagan." Every year, the Sun-Rype Founders' Scholarship Fund will provide three scholarships of $2,000 each. The awards will be made to students from the Okanagan region, selected on the basis of academic merit, who are entering their first year of study in the Irving K. Barber School of Arts and Sciences or the Faculty of Management at UBC Okanagan. "We appreciate the generous support UBC Okanagan has received from Sun-Rype, a company that shows tremendous leadership in the Okanagan," says Doug Owram, Deputy Vice Chancellor at UBC Okanagan. "These scholarships will enable more Okanagan students to join our arts, sciences and management programs. They also represent the continuation of Sun-Rype's long tradition of philanthropy and support for students in the Okanagan." This latest gift to UBC Okanagan builds on previous support by Sun-Rype to the University. In 2004 the company contributed $50,000 and established a research and development partnership with the Okanagan Regional Chemical Analysis Centre at UBC Okanagan. In addition, through the Sun-Rype Products Scholarship program, Sun-Rype has contributed to post-secondary education in the Okanagan for many years. The first scholarships from the Sun-Rype Founders' Endowment Fund will be awarded for the Winter 2007-2008 term.